Appetizers | real food. home made. Place 1/3 of your sliced cabbage into a large bowl and sprinkle 1 T of salt over it. Using your hands, squeeze the cabbage until water begins to come out of it. Repeat this process, adding the remaining cabbage and salt 1/3 at a time to the bowl. This will take time and will be a great workout. Add the shredded carrots, garlic, jalapenos and black pepper to the mixture and combine with your hands. Fill two 32 oz mason jars evenly, pressing the mixture down so that water releases and raises above the line of the vegetables with 2 inches of air space remaining at the top. Wedge the large outer cabbage leaves into the top of the jars so that the mixture is pressed below and the water level raises above the leaf. A shot glass serves nicely as additional weight to keep the mixture held securely down. Store the jars in a secure, cool, dark place where they will not be disturbed. Check on your sauerkraut every few days to make sure that all the vegetables remain under water. If needed, add some fresh water on top, but you should be okay, especially if you use a shot glass weight. After two weeks, your sauerkraut will be ready to eat! 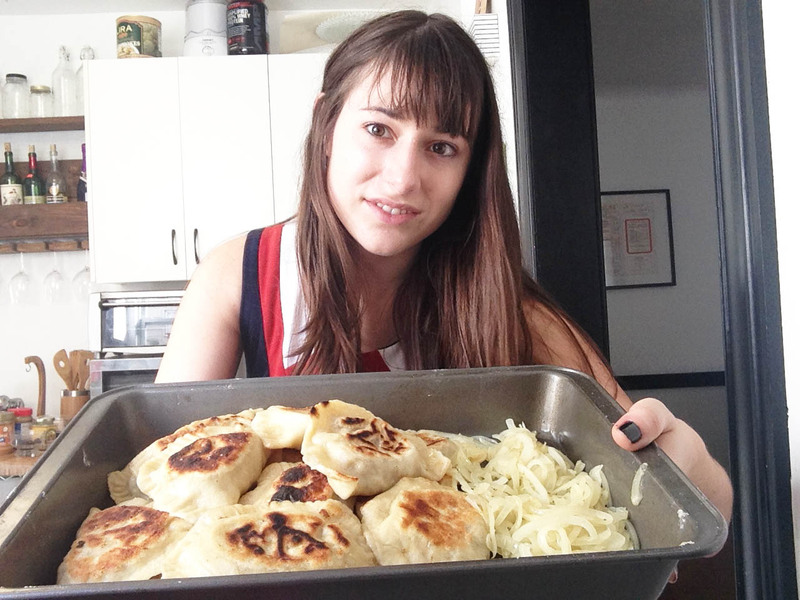 Store it in the refrigerator until you are ready to make your pierogies. Knead the dough ingredients together, and store it under a towel until required. Heat the butter in a frying pan over medium-high heat. Add the onions and mushrooms, and cook until sufficiently wilted. Add the sauerkraut, and cook for a few minutes. Add the pepper, and taste for seasoning. Add some salt if it needs it. Transfer the filling mixture to a bowl and let cool. Start a pot of water boiling. Flour your workstation. Take out your dough, and roll it out until it is pretty thin. I run the dough through my pasta maker, which makes it a bit easier, but I’ve made many a pierogi without one. If you don’t have a rolling pin, use a pint glass or a 40. Use a glass or small bowl as a cookie cutter, to create multiple little dough circles. Taking one dough circle at a time, roll it out slightly bigger, add filling, moisten the edges, and crimp shut around the edges with a fork. Drop 6 pierogi at a time into the boiling water, letting them swim for about a minute. Remove them from the water, and place immediately into an adjacent frying pan lined with butter set at medium-high heat. Fry the pierogi on both sides until desired level of brown-ness has been achieved. At the polish banquet hall I used to work at, they liked us to brown them ever-so-slightly. I myself prefer them a darker golden brown. Serve with sautéed onions and sour cream. Thoroughly combine all ingredients in a large bowl. 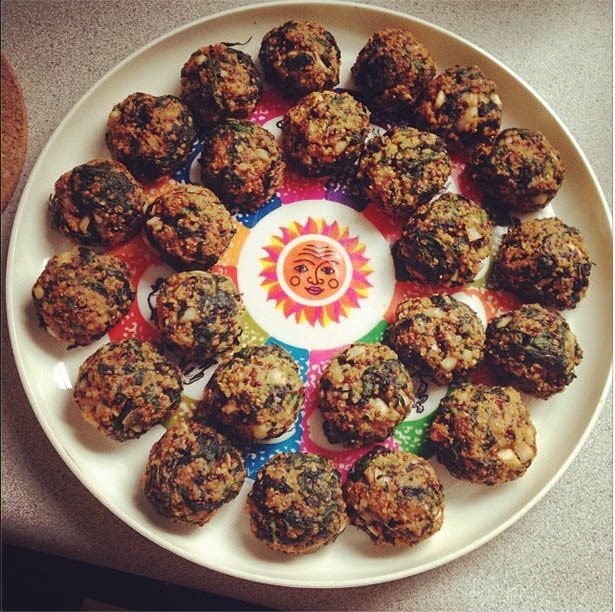 Form into comfortably sized balls, and refrigerate for at least one hour. Store in an airtight container for up to a week. If there are leftovers, pop them in the freezer to enjoy any time at a moment’s notice! I love these little guys. They are perfectly satisfying when you feel like a quick, healthy snack. Forget processed granola bars! These are the real deal. Prep all of your ingredients. In a large frying pan or wok, heat the sesame oil over medium heat. Add crumbled tempeh, mushrooms and ginger. Once the tempeh starts to brown and the mushrooms are wilted, add in the cabbage, carrot, and garlic, and cook for a few minutes. Add in the liquid aminos and rice vinegar. Then the green onions. Prepare your workstation! Fill a custard cup with water, and prepare a clean dry surface. 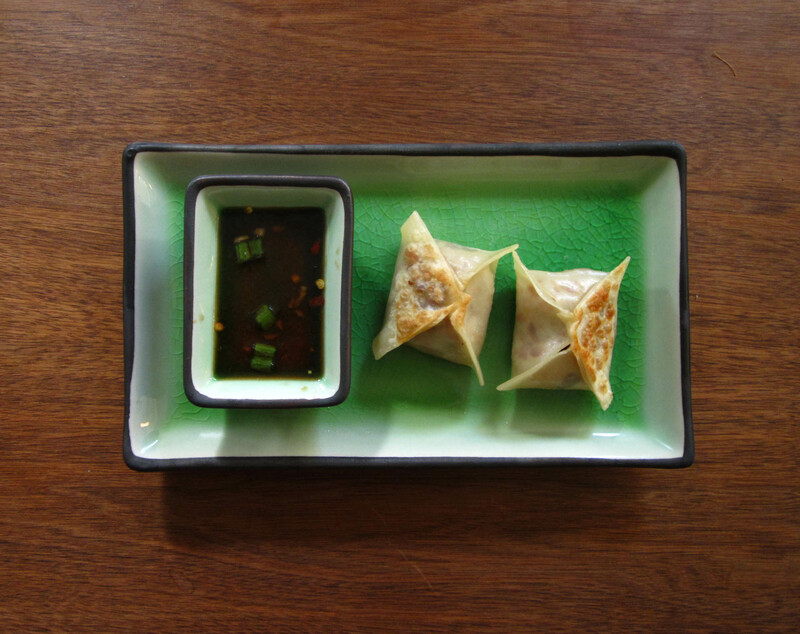 Lay out one wonton wrapper at a time, fill with about a tablespoon of filling, dip your finger in the water to wet the edges of the wrapper, and then pinch the edges together so they stick. Repeat 48 times. (Or if you’re like me, do 8-10 at a time). Use this time for meditation. Meticulous potsticker stuffing will be only as annoying or as rewarding as you make it. Heat a bit of coconut oil in a large frying pan or electric skillet over medium-high heat (let’s just go ahead and say 7, can we say 7?) Add 8-10 potstickers to the pan. When they reach your desired level of golden brown, add a splash of water and cover with a lid to give them a little steam. I turn off the heat at this point. Cook the rest of your batches and then you will finally finally be done! Hope the party guests tonight like my new concoction! Bring quinoa and chicken broth to a boil, cover, reduce heat, and cook for 20 minutes. Make your flour mixture by adding a handful of almonds and a handful of old-fashioned oats to a food processor and grind – Make a 1/2 cup of flour total. Mix quinoa, flour, and all other ingredients together in a large bowl. Grease baking sheet with coconut oil or butter. 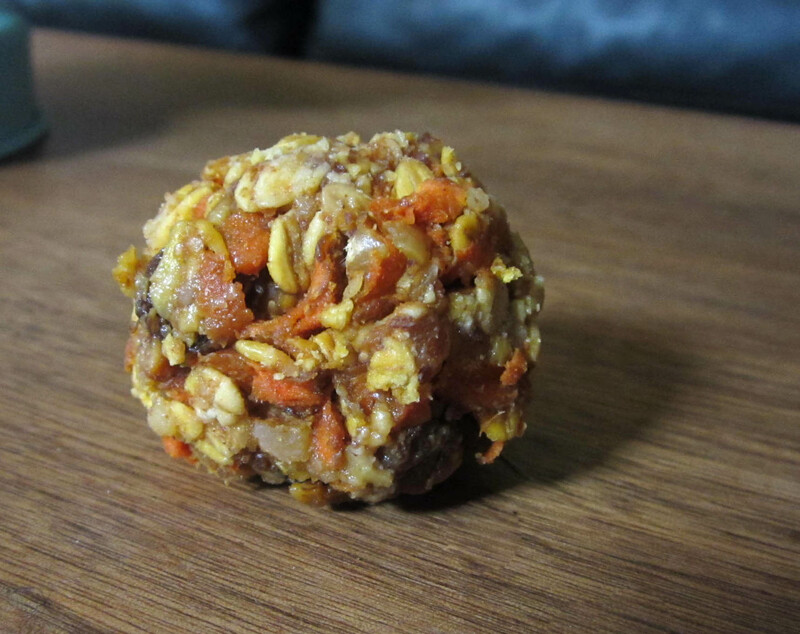 Roll mixture into balls and bake for 20-30 minutes. These are so pretty! If you use red quinoa, the red and green colour scheme make them perfect for bringing to Holiday parties! This advertisement came in the mail yesterday, and I burst out laughing. I am going to start collecting these prime examples of our country’s sickening problem with food. 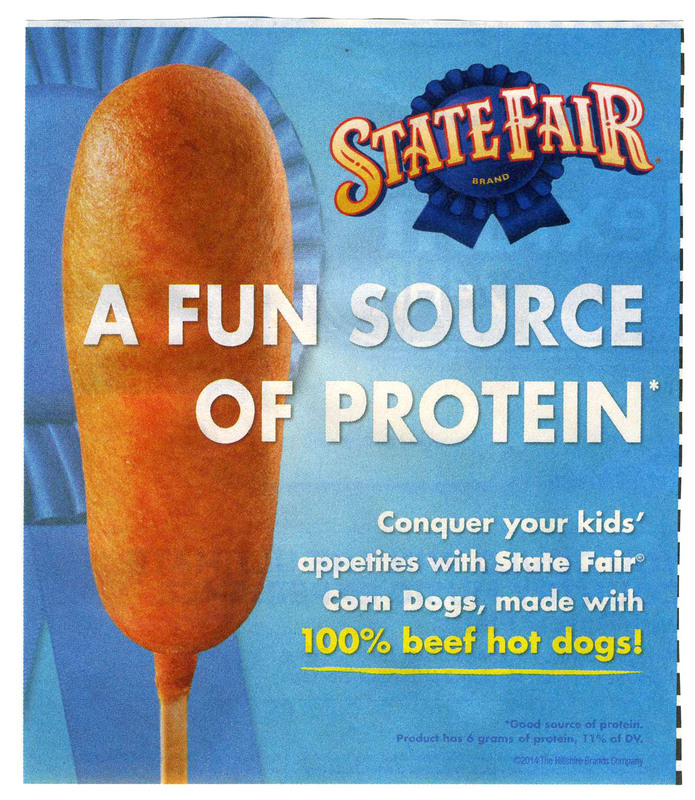 We are equating the word “protein” with “corn dog”? How did we let this happen? Protein is one of the prime building blocks of life, I feel so sorry that the word has to appear so large alongside this abominable “edible food product”. However, corn dogs are not inherently bad. 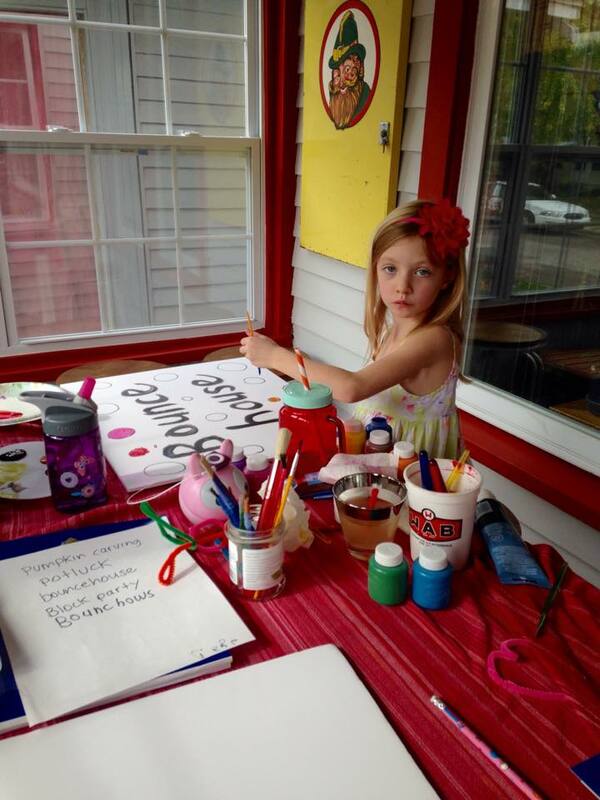 I believe that as long as you make a dish home made from quality real food ingredients, nothing is off limits! Not even corn dogs. 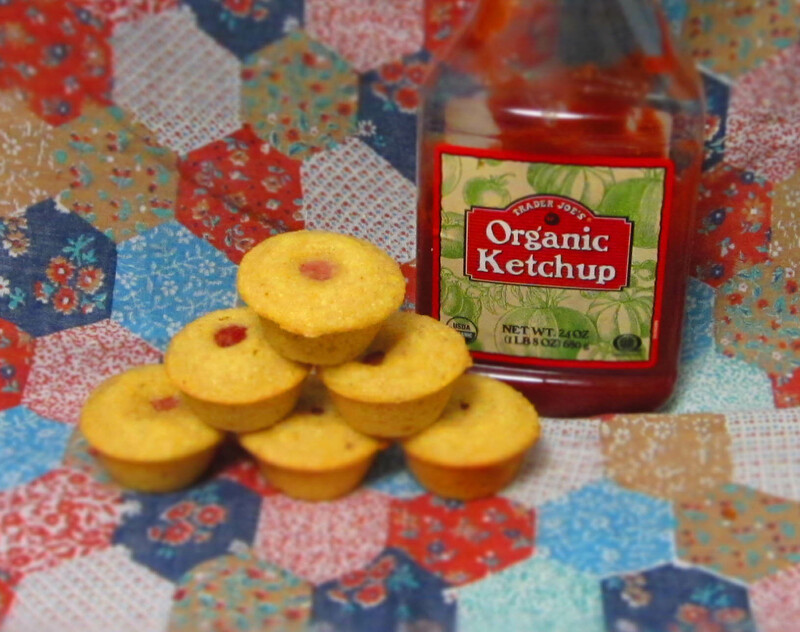 Following is a recipe for mini corn dog bites – they are an excellent appetizer to bring to a superbowl party, or any other gathering under the sun (except maybe a vegan potluck). When reading the labels on packaged food products, ask yourself the question: “Are these the ingredients I would use to make this item”? If the answer is no, which it will be more often than not, do not risk it. Remember, your body is not a garbage can. Whisk butter and sugar together, add eggs, then buttermilk, whisking them all together. Whisk dry ingredients in a seperate bowl: cornmeal, flour, baking soda and salt. Spray a mini muffin pan with coconut oil. 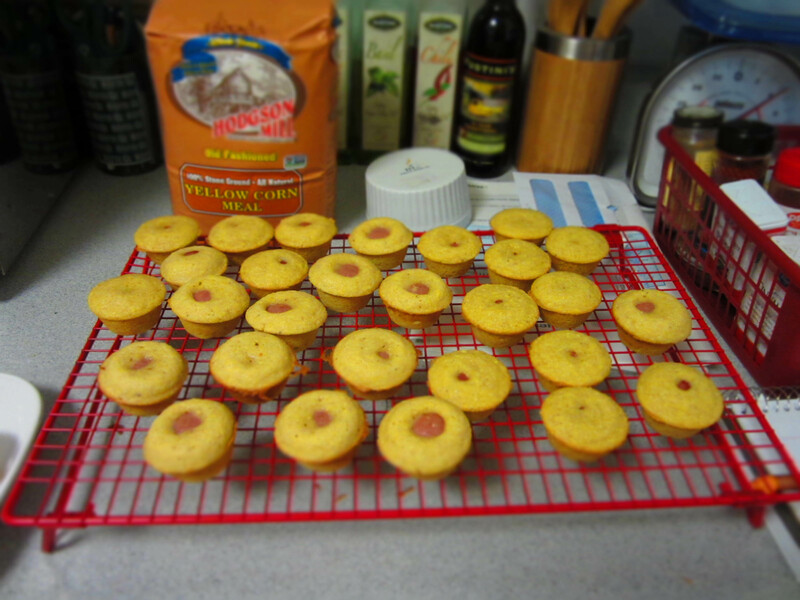 Add a glop of batter to, then press a hot dog section into the center of, each cup. Each cup should be nearly full but not quite. Bake for about 15 minutes or until cornbread just starts to brown. Let them cool for as long as you can stand it, and then transfer to a tupperware to bring to the party. You can serve these at room temperature, or re-heat them in the oven for a bit at serving time. Now that’s a fun source of protein I can get behind! 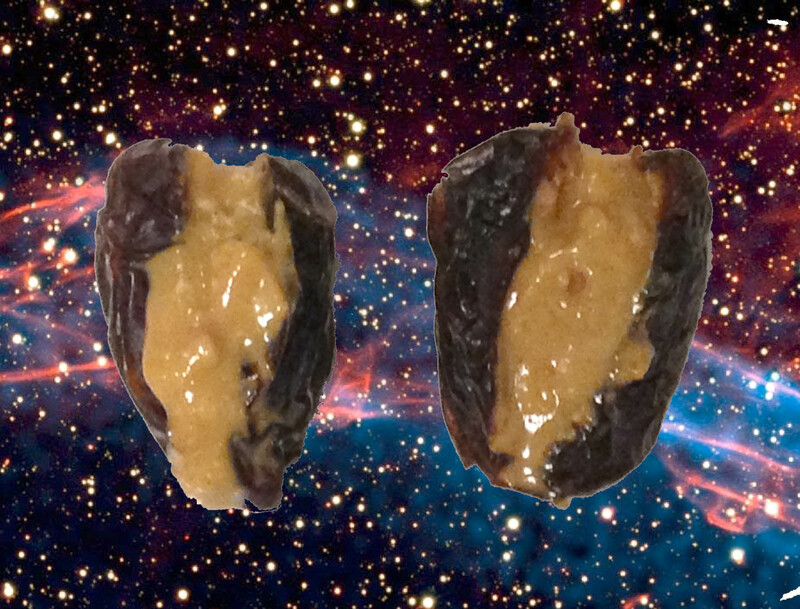 These look much more appetizing in space than they did on my plate. You know that feeling when you try to go to bed and you can’t sleep because you are hungry? This is the perfect cure for that feeling! It can also be served as an appetizer, a dessert, a mid-morning or after-school snack. 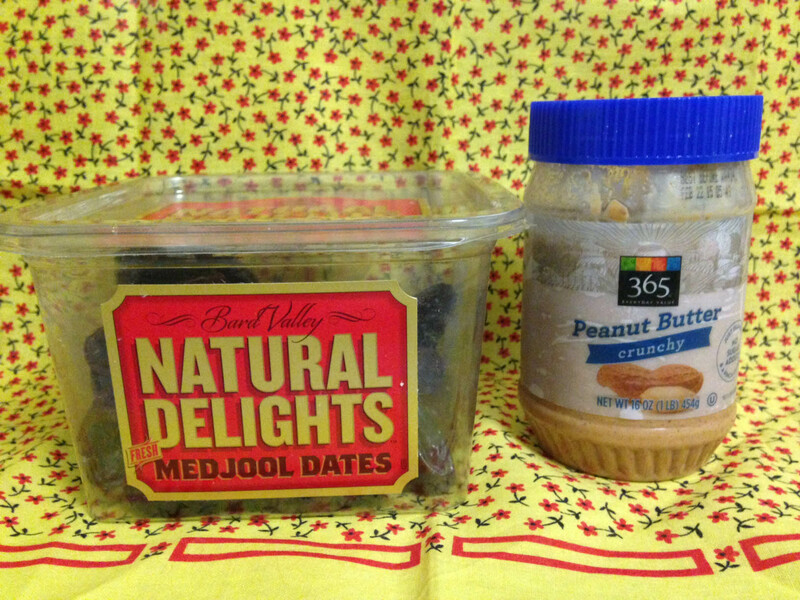 It is simple, requiring only 2 ingredients that you should already have in your pantry! Watch your hunger pangs disappear!